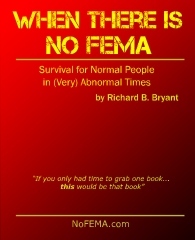 This site is the home of the book “When There is No Fema – Survival for Normal People in (Very) Abnormal Times” (“NOFEMA”) – an essential reference for anyone interested in preparing to survive the full range of natural and man-made disasters. You are not here by accident. If you found your way here, you are looking for information to help prepare yourself, your loved ones, and maybe your community, to deal with difficult times. If that’s the case, you’re a few mouse clicks from what has been referred to as the most complete disaster preparedness reference ever written – a book that has been termed “Encyclopedic” by professional disaster planners and trainers. Richard Bryant, the organizer of one of the largest survival groups in the US, authored this book when he realized that none of the survival books available provided sufficient breadth and depth of knowledge to enable his own family to survive a major disaster. Over three years he labored over this book as if his own family’s survival depended on it. Unlike other preparedness books, NOFEMA is not a “Frankenstein” copy-and-paste job from other sources – it is all original material, authored with painstaking research and using the same tools that academics use to create textbooks. So much research went into this book that the bibliography alone is 19 pages long (many other books on the topic feature neither bibliography nor index). When other preparedness books might suggest that you “grow corn”, NOFEMA identifies the growing seasons, specifies how deep to plant seeds, how far to space the rows, what soil to plant in and how to deal with pests. It provides similar degrees of detail on virtually every aspect of disaster preparedness including – not to be found elsewhere – organizing your own local community to survive the full range of worst-case disasters. See for yourself! The first 60 pages of “When There is No FEMA” are available HERE for free as a downloadable PDF. When you understand exactly what this book has to offer you may click the Shop link at the top of the page and order your copy. You will not be disappointed! As time passes this website will offer other high-quality survival gear and references in our online store, so do pay us a visit from time-to-time. Also feel free to visit our ‘Contact’ link at the top of the page to provide us with any feedback you may have.